Today was my first formal presentation on how to research the history of your house. The Webster Groves Historical Society, as the sponsor, provided wine, cheese and crackers for the attendees. One of the members sat at the table near the entrance and collected money from the book sales for me, so that was really helpful. I donated 20% of the sales from today to the Society, so they had extra motivation to push the books. We ended up selling 6 books. Considering the audience consisted of about 20 people, some of them couples and a few who I knew had already bought the book, that was pretty good. It was a comfortable size in terms of number of attendees as I got fairly decent audience participation. Jim had volunteered to come with me, which was great as he advanced the PowerPoint presentation for me. We had a moment of silent panic at the beginning when my computer froze. We had arrived 30 minutes early to set up the equipment and make sure all was in working order. Of course at the critical moment it would fail. I made a joke about technology and then quickly restarted the laptop. Fortunately we were error free after that. I'm pretty happy with the slide presentation as a whole. There are a couple of other graphics I would like to add for next time, but overall it flowed nicely. Feedback from the people who came up to speak with me was favorable, so that was good to hear. Bring on the next one! As I mentioned earlier, a couple of months ago an organization invited me to give a talk about how to begin the process of researching your home. They said they would do all the promotion and provide refreshments, and that I could sell my books as well. Sounded like a win-win. The promotion has not been forthcoming. 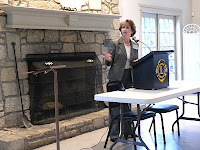 There was a brief mention of the talk in their winter newsletter, which goes out to the members. It didn't say where the presentation was being held or who to call for more information. A few weeks ago the President told me she was going to mail postcard reminders to all the members, and those never went out. Of course I told the reporter from the Webster-Kirkwood Times about the meeting, and thankfully she put that info in the article she wrote about me. The talk did appear in the calendar section of the Times today, albeit in the Saturday listing and not Sunday. And the organization took out an eighth page ad, spelling my name incorrectly and not mentioning what I will be speaking about. Hopefully people will get the gist from the title of my book, if they can read it in the minuscule ad. I am very concerned that there will be a very small turnout due to lack of publicity. Despite all this, I have been diligently working on my PowerPoint presentation. Since Katie is home she was able to show me how to do a screen capture so I can put information about the St. Louis County website into my slides. That was cool to learn. I'll probably have her look at my slide show when I'm done as she may be able to pretty it up for me. No matter what the turnout, I needed to get this presentation prepared anyway. We'll see what the response is to it. The article about researching house history and my book was in the Friday issue of the Webster-Kirkwood Times. Marty Harris did a wonderful job of explaining how I went about the research to receive my Century Home plaque, and why I felt compelled to write a book to help others with the search. She also put in a nice plug for the presentation I will be giving Sunday on how to begin the research process. I am extremely happy to have that advertisement since the Webster Groves Historical Society, which is sponsoring the talk, has done little to promote it. They had a little blurb in the winter newsletter, noting the date and the time, but it didn't even mention where the program would be held or who to call for more information. A post card was supposed to go out to all the members, but I haven't gotten mine yet. It is a little frustrating as I was assured they would do all the promotion for the program. These types of presentations are where I believe my books will be sold in greatest numbers, not through individual bookstores. 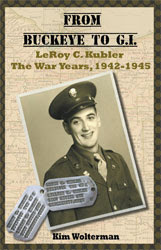 Speaking of sales, I sold another book at the St. Louis Publishers Association meeting last Wednesday. And the Missouri History Museum Library and Research Center purchased a copy for their facilty as well. I was hopeful that once they purchased a few copies to sell in the Missouri History Museum gift shop that they would decide they needed a copy for the library as well. 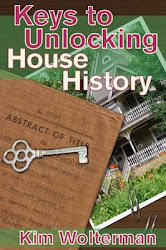 Because their library offers a House History 101 course, that will be great exposure for my book.